It's no small feat in a country where taxi horror stories are practically the norm. (SPOT.ph) The scene is all too familiar: It’s a gloomy morning and everything seems to be working together to make you late for work. The queue for public transport snakes around the block, ride-hailing apps say there are no drivers available, your usually-reliable work shuttle says it’s too full to let you on—and it just started raining. Hard. 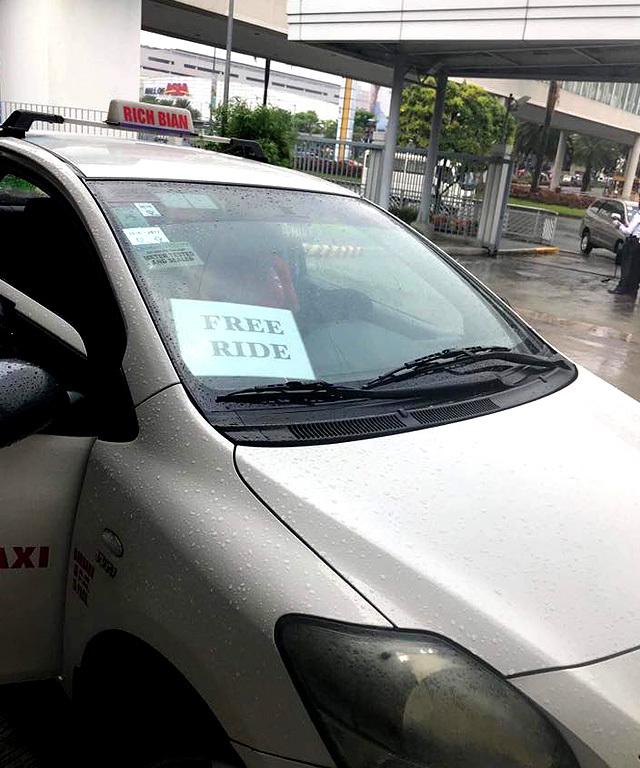 That’s exactly what happened to Bea Chiong and Jeune San Juan on August 31, when they happened upon one taxi with a sign that read "FREE RIDE." Although they suspected it was just a ploy to get passengers, they hopped in the cab to get out of the rain and rush to work. Inside, they were pleased to discover it was indeed a free ride, with no strings attached. 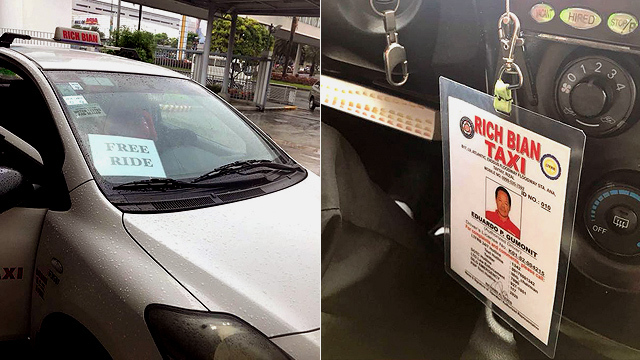 Richard and Bernadette Teves, the owners of Taytay-based Rich Bian Taxi, simply want to spread joy among the commuters of Metro Manila. 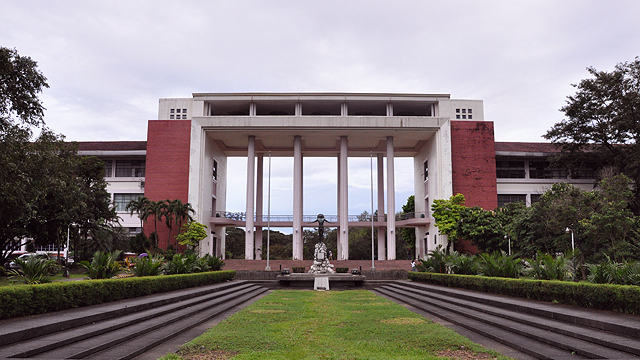 The two posted about their experience on social media and it quickly became viral. Their experience expresses what most fatigued travelers feel upon hearing this good deed: "Faith in humanity restored!" Since the beginning of 2018, passengers have been coming forward to share their surprising experiences getting free rides from Rich Bian Taxi drivers. 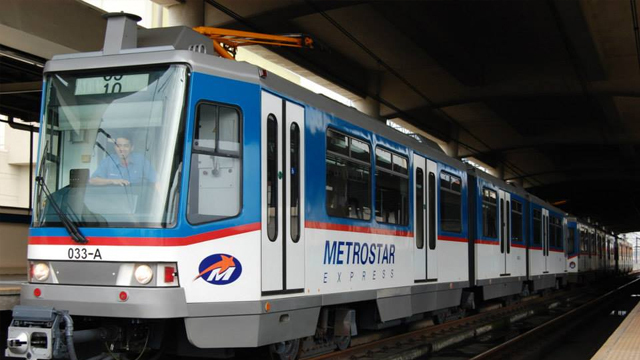 Although the policy isn’t listed anywhere on the company’s site, customer after customer has confirmed that, at the end of each month, the fleet doesn’t charge passengers for any drop-off within Metro Manila. Drivers report that it is the owner’s way of "giving back to humanity." Knowing what it’s like to be in need, and now being in a position to help those in need, the Teves couple makes it a point to share their blessings with others. And while they maintain a low profile, their customers’ glowing reviews are putting a spotlight on the company’s refreshing take on service. 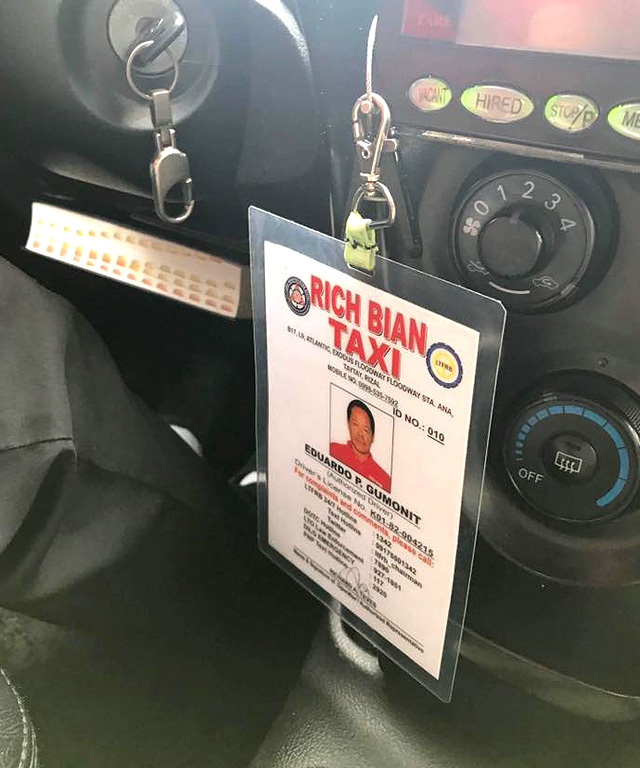 A quick scroll through Rich Bian Taxi’s Facebook page will show a unanimous five-star rating, with customers raving about how nice the drivers are. A reviewer named Ra Ni says "super bait ng driver nila." Another reviewer named Selly Nah recounts in nine paragraphs how one driver named Mark Jill Nebrao made her day—not just by offering her a free ride when she only had P100 in her pocket, but also by referring her to an open position at the company when he found out she was unemployed. Customer service doesn’t end with friendliness though. 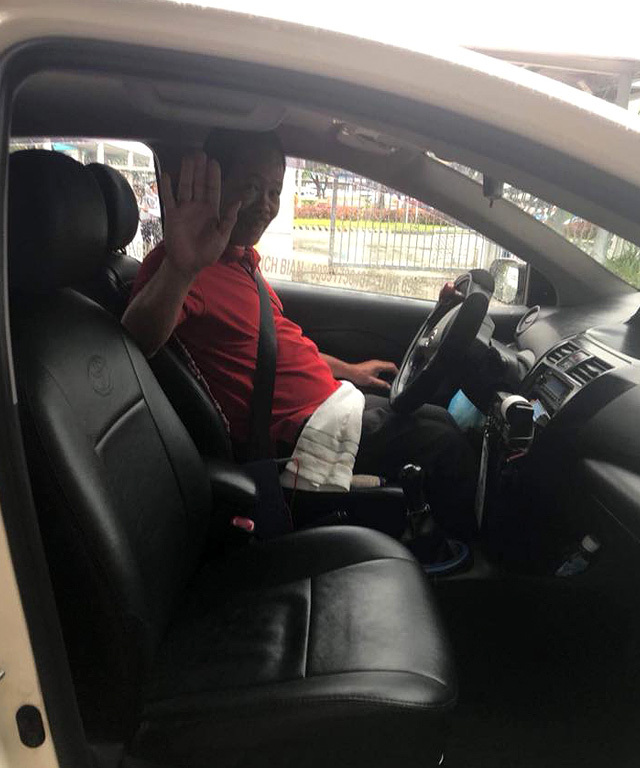 Stephanie Perez Paras says, not only was the driver "very polite and nice" to her when she received her free ride from Quezon City to Ortigas Center, the car quality was also excellent. In particular, she enjoyed the cleanliness, cool air, and lack of suspicious smells. “Masarap sumakay at magbiyahe kapag ganon ang mga taxi,” she says. Rich Bian Taxi’s understanding of and response to the needs of the customers is a dose of positivity that has rippled out into the world. In the now-private post, Chiong and San Juan encourage recipients of the taxi's good deeds to "pay it forward." In an interview with SPOT.ph, both passengers note that they were able to continue the chain-reaction of kindness by helping to change stereotypes about taxi drivers. "By sharing the good news and appreciating the good deed that they’re doing...we’re more understanding and less angry with [taxi drivers]. It’s such a relief that there are still good people in this world, after all,” they say. This is a huge help for taxi drivers as it guarantees income for the day. Usually, how taxi companies work is that the owner of the fleet receives a guaranteed P1,000 or more per day from each driver. Meanwhile, on top of doing the hard work and taking all the risk, drivers have to cover gas and other costs. This means that sometimes, drivers will work all day, and earn nothing. Horror stories about taxi rides and cab drivers may still be all too common, but this company is doing what it can to change rush-hour culture—and therefore, Metro Manila culture—for the better. We all look for honesty and kindness when dealing with people on a daily basis, but sometimes we might forget to practice those values in return. Imagine how much better being stuck in traffic would be if we all followed Rich Bian Taxi’s lead.